Gamezine, another great design from Jinsona for game lover, and converted to blogger by my friend, Cahaya Biru, great job Man ;) . 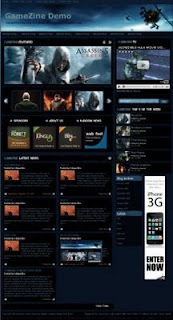 Gamezine Blogger Template suitable for gaming site. So many element and image you have to upload, but don't worry he'll guide you step by step to install. To avoid bandwidth exceed, suggested to upload image on your own imagehosting. Here's the screenshoot. Click to go to original site. OMGAWDDD Ive been tryin na find a blog designer..
Uhhh do u erm do u do requested blog skin..? CAN U PLEASE SERIOUSLY REPLY MUA coz am willing to pay***!! Gagah, tapi download dimana ya ? ATTENTION! this template doesn't really work. Pay attention at all online demos and you'll see that not even the designer didn't succeed to make it work in a demo. I tried myself to install it, but i had a terrible disappointment. Game zine magazine is very nice and more interesting magazine so that can be know that and entertainment Magazine. Mostly people are very like it. Fantastic blogger and interesting blogger shared on the site so that can be enjoy it.Mostly people are very like it. This is nice blogger.